Have you considered the amount of time you spend on your phone or in front of a screen? Many people like me have become concerned with the amount of time we spend using devices such as: computers, tablets, and cell phones and it is also a subject of debate among authorities in the field. It’s easy to become consumed with our devices because technology has made it so easy to find information, chat online with friends, and research anything we might want to know about. Personally, it often feels like I’m missing out on something if I’m not using my phone. However, excessive screen usage can greatly limit face-to-face social interactions or the likelihood of participating in real-time activities. 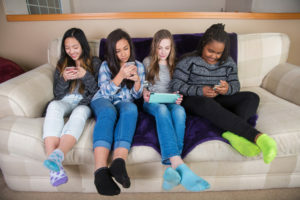 The first step to cutting down on screen time is identifying how much time you actually use your phone, laptop or other devices. For example, there are certain apps such as Offtime, BreakFree, etc. that allow you to track the amount of time you spend on your cell phone and help you reduce it by setting limits. You can also turn off the notifications to the social media apps you use, so you won’t be tempted to pick up your phone. Usually notifications are red; a trigger color that instantly draws our attention so by turning the notifications off, you will not be distracted. You may also consider deleting social media apps during the week so you are more apt to get school work done without being distracted by posts. Another strategy you might try is keeping your phone out of arms reach at night such as charging it in another room, so you won’t be tempted to check it. Completely prohibiting yourself from using your cell phone or other devices is unrealistic; therefore, you might decide to slowly decrease the amount of time you spend in front of a screen. This will give you free time to meet up with friends in person, try a new hobby, or simply relax. You will be able to reclaim the time that you would have spent in front of a screen or on your phone and direct it towards activities and friendships you truly care about. In an effort to reduce your own usage, you might want to consider asking your family to participate as well! Adults use their cellphones just as much as teenagers do and will also see the benefits of cutting back on screen time. Make a “no phone” rule at the dinner table, it’ll help start conversations. You should also aim to keep your phone away from your bedroom as studies show that having a phone in the bedroom can reduce your quality of sleep and your well-being. Eventually, you will not feel the urge to constantly check your phone for updates. Instead, you will be satisfied knowing that you have successfully taken control of your screen time.